At long last, I have taken great strides to paint my first model in three years! All comments and critique is welcome, just be gentle . I will say that I did buy the Soul Wars box set and that kind of delayed me in getting started on painting, as I wanted to prime the Stormcast and Idoneth in one go with some black primer. Also please note that the coastal base is not yet finished. Still have to apply the realistic water effects! I'm using Imgur all the time - it's the only resource that works well for me. But I use it from PC - its smartphone app does something silly with uploading images. 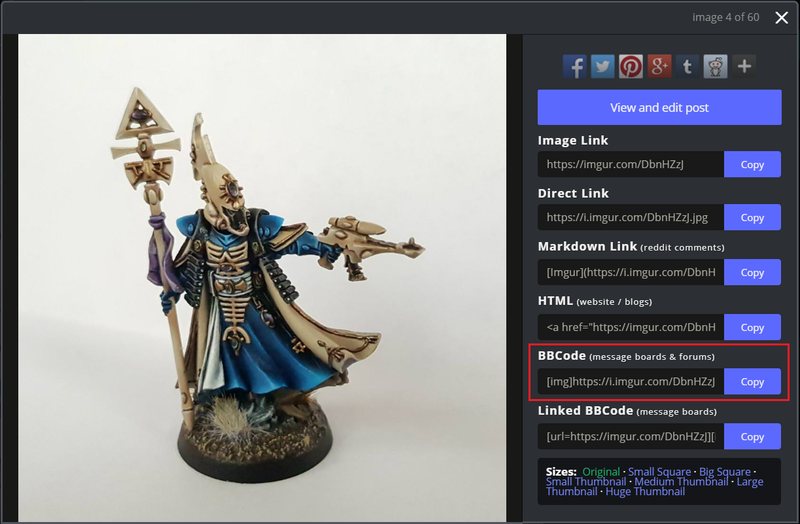 You click on the blue button "Copy" beside the field labelled "BBCode (message boards and forums)" (the one that I highlighted with a red box) - it will copy a BBcode that you then simply paste into you forum post, and that's it. 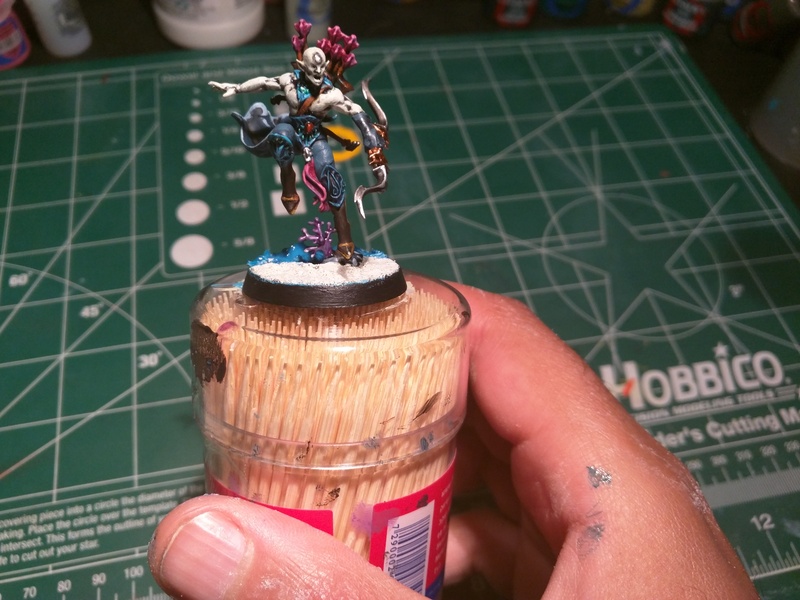 great job on the reaver, nice balance of colours, and the water should look fantastic with a coat of water effects. Buddy is looking great! 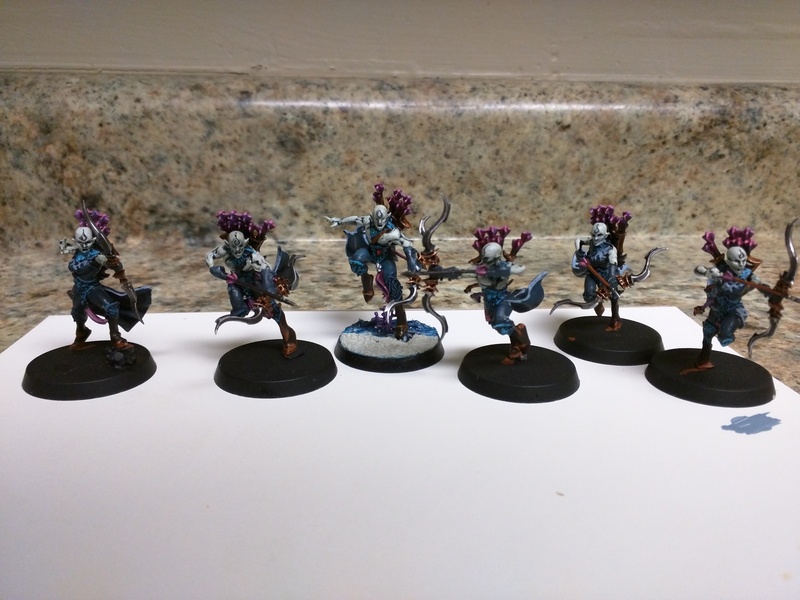 The Deepkin line is absolutely gorgeous and your scheme does them well. Thanks guys, that means a lot ! I think I need a little more patience when applying thin layers onto the model when it doesn't cover well. You can kind of see on the skin that a little bit of the detail got lost. So I'm going to be a bit more careful on the other models. As it is, I think you've done a good job. The palette that you've chosen is excellent. The vibrancy of the pink especially draws the eye in well. Everything else being muted acts as a perfect counterpoint. Thanks for the compliments, Loosh, and thanks for the advice too, I'll have to use some extra temperance to let the paint dry . I admit, I still really love the Fuethan color scheme, but I agree that there is a subtle dark beauty to the Mor'Phann that I too find really cool. 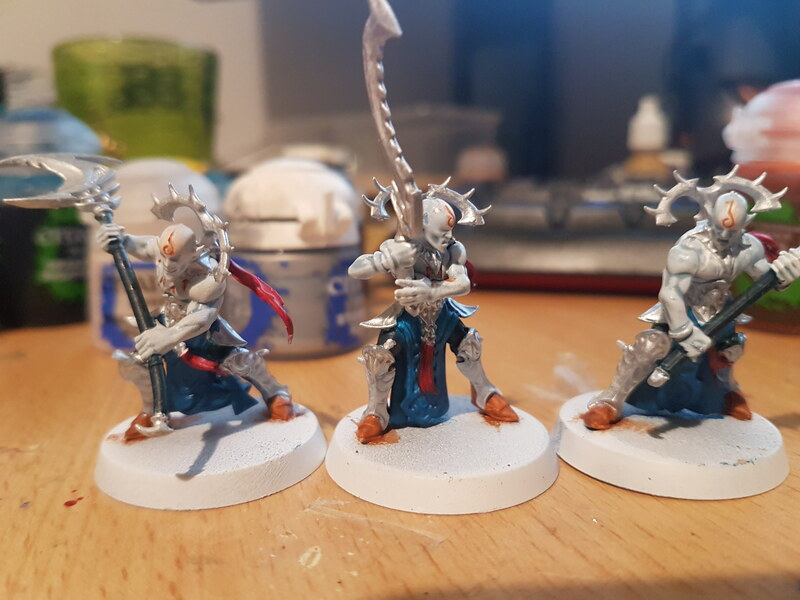 Having finished the test model some few weeks ago, I have now started the assembly line for getting these guys painted, five at a time. 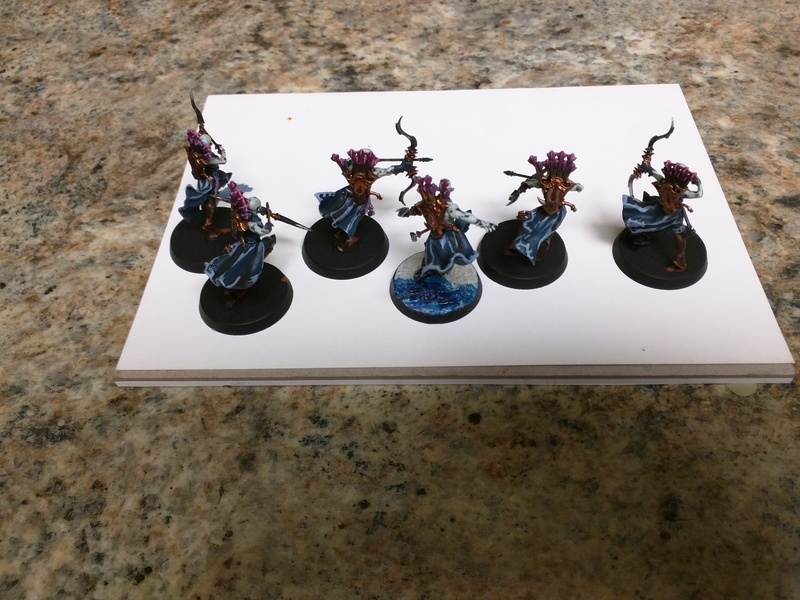 They still have a few rough spots that need neatening up, their gems haven't been worked on yet, and the bases are still bare... but they are nearing completion . On another note, I am going to have find a different method of shading the skin then the Drakenhof Nightshade I am using. I do thin down the nightshade with lahmian medium, but the shade is still way too dark. It's not that noticeable on the male Reavers, but on the female variants, the shade is a bit harsher. I think I am going to switch out the nightshade for some Gulliman Blue for the next Reavers I paint. On another note, I am going to have find a different method of shading the skin then the Drakenhof Nightshade I am using. I do thin down the nightshade with lahmian medium, but the shade is still way too dark. It's not that noticeable on the male Reavers, but on the female variants, the shade is a bit harsher. I ran into the same problem, as nightshade was just too dark, so I put a lot more Lahmian in the mix, then did a thin coat of pallid wych flesh on to. I also ran across someone that basically turned fenrisian grey to a shade, I might try that on a thrall. I should note that I undercoat in white though. I like the way the highlighting is done on the robes/capes! I'll have to give that a try. Looking solid so far. Looking great! I like the way you've based the finished one as well! Actually if you're still looking for a good shade, I think Gulliman Blue Glaze is what I'm going to experiment with next. I think that's what the heavy metal team uses for their Namarti. And thanks for the compliments . Thanks, Blazinghand, I don't think I even intended for the cloaks to come out that way. They kind of look like they're made of water and that's super cool . If you're interested in how I did the cloak. It's basically Stegadon Scale Green, followed with a heavy wash of Nuln Oil, then the raised areas are brightened back up with Stegadon Scale Green, then a highlight on the higher folds with Russ Grey, then a final highlight of Fenrisian Grey. 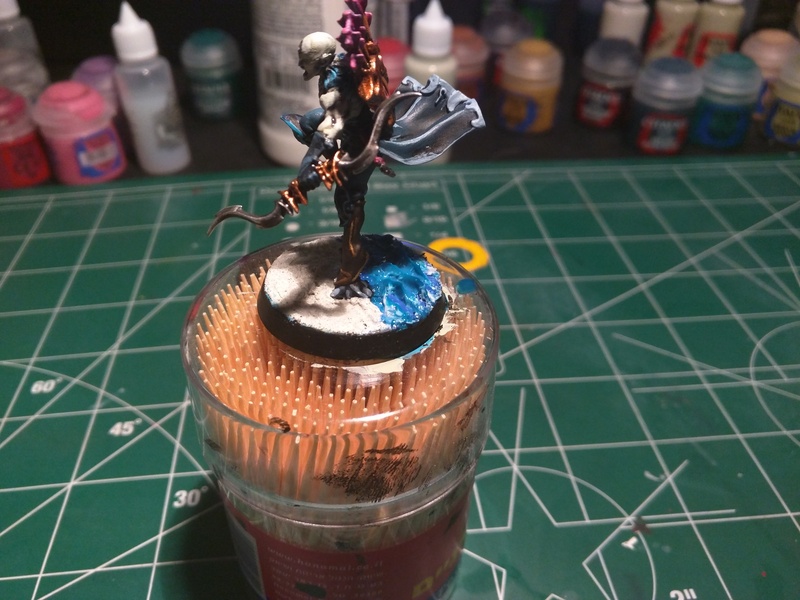 Thanks, Squid, I'm actually following a YouTube tutorial for the basing, but I think it's turned out very well too. I was a bit hesitant because I thought I'd muck it up, but it's actually come out quite decently . well if you want to give the fenrisian grey a shot, here is what happened from my testing on my thralls with a 50/50 mix lahmian. The one on the left has a had a thin layer of pallid wych flesh. Huh, that actually looks great ! I think I will give this a shot! 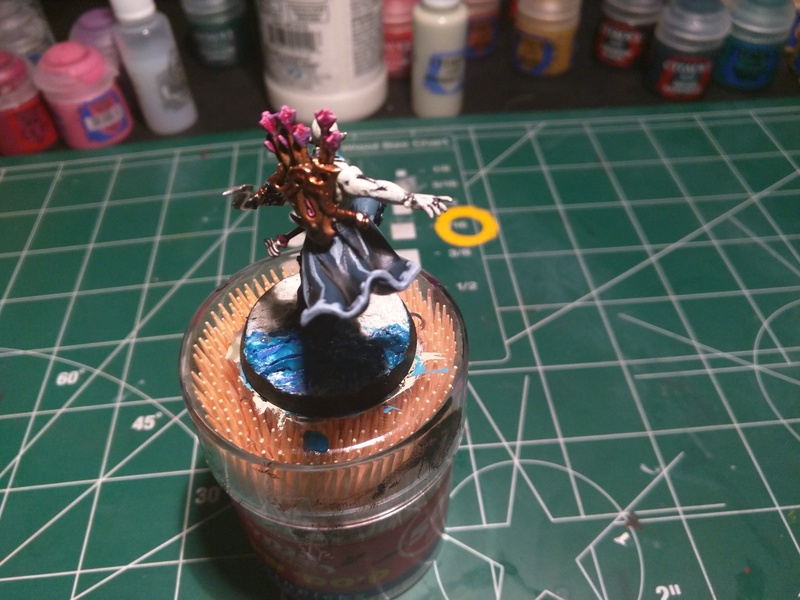 It seems similar to the effect that Guilliman Blue has, but this one seems a bit more subtle and still complements the Namarti quite well. Did you thin it with just lahmian medium? I love those Reavers Myen'Tal. The cloaks look like a particularly stormy sea...the colours are excellent and really compliment the models wonderfully. The completed base looks terrific too. Keep up the excellent work! Thanks, Loosh, glad you like them! I'm also liking the way the test base turned out. And the cloaks look way cooler in reality than I imagined them. Whoever created the Mor'Phann scheme made a great choice . On a side note, I decided to follow your advice and grab some of the White Dwarf Magazines for more inspiration for painting my Akhelian Guard. I haven't touched them yet because I'm not sure yet how to tackle them. Hopefully, this will teach me a few tricks! @Everyone: Thank you everyone for the comments and feedback, you guys are really inspiring me to keep this going ! On a side note, I purchased one box of Namarti Thralls and two boxes of Allopexes... based on the decision that I want to try Allopexes in my list! I'm going to finish the Reaver squad in full before I move on to the next unit. Here is the current list that I have (which may or may not be a little Magenb influenced . I had a quick game just using the Namarti Corps, Bretonian knights cleanout out a 10 man squad on charge, it might be worth having a 20 man squad of thralls, not sure if it will workout in the battleshock phase though. Yeah, that's something I've taken into consideration. I'll probably experiment between 20 / 10 man squads and 10 / 10 / 10 man squads. The Namarti are a bit fragile on their own, but I think the Namarti Corps will become much tougher with the extra strength of support units. A Leviadon is going to make nearby Namarti more durable, but once you add in some more akhelian units (and even the leviadon himself), you can set up some devastating counter charges that can punish your opponent (if the dice gods will it!). I imagine if that unit of Bretonnian Knights charged and cleared out a bunch of Namarti, a group of semi-nearby Akhelians can easily close the gap, get in a charge, add in the extra damage from their successful charge, then pop the Bio-voltaic spear for the game, they could probably chew on that unit (and there is also the Fangmora Eels' bite!). That's what I plan to use my Morsaar Guard for. The Allopexes will also serve as a close range threat. Harassing enemies with the 2-3 damage (Cannot remember which one) Retarius Net Launchers, before they slip into the back of some crucial combats and hopefully deal in some good blows. Then like the Morsaar Guard, I plan for them to slip back in and out until the foe crumbles. Doubt it'll work like that in practice , but the plan has to begin somewhere! The Akhelian Allopexes or the Leviadon could easily do the same I think. As an alternative, Ishlaen Guard can become your anvil for the Namarti to lay down some hammer blows of their own. I'll be interested to see how those shark fair.